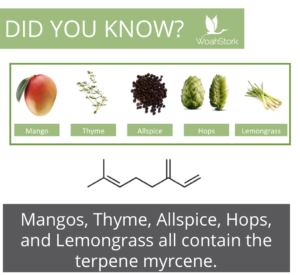 You may never have heard of myrcene, one of the flavorful antioxidants found in the marijuana plant, but if you’ve tasted India pale ale-style beer, you know what it smells and tastes like. That’s because myrcene is the bright, citrusy molecule — in a class of hydrocarbons called terpenes — that gives hops their particular flavor and smell, and IPAs are among the hoppiest beers. Myrcene is also found in thyme, allspice and many other aromatic plants and herbs around the world. Read our post on the similarities between cannabis and beer. Concentrated myrcene — which is traded commercially as a food flavoring and ingredient in cosmetics, lotions, air fresheners and cleaning agents — is very dangerous. It’s highly toxic; burning skin, closing up airways and even inducing seizures. Its vapor is highly flammable. If spilled into waterways, it’s deadly to marine life. In pot, hops and other herbs, however, its implausible it can cause harm. In fact, it’s been shown to have a protective effect against liver toxins and has other antioxidant properties. It’s part of plant treatments against certain tropical parasites as well. The classic indian beverage “Bhang” is made with cannabis and mango to accentuate the effects of myrcene. One exception to this is for brewmasters and agricultural workers who continually handle large quantities of hops. A case study of one brewery inspector described upper respiratory problems, sneezing and skin rash, which scientists traced to prolonged exposure to the myrcene in hop dust. Myrcene is one of many terpenes in marijuana implicated in the “entourage effect,” the phenomenon in which the hundreds of different chemicals in marijuana influence and modulate one another’s effects to produce the particular psychoactive and therapeutic effects of the cannabis plant in humans. Myrcene and its fellow terpenes work in concert with cannabinoids in marijuana — the most potent of which are Delta-9 tetrahydrocannabinol (THC) and cannabidiol (CBD). How all these chemicals work together is still unclear and remains a favorite — if difficult — topic for cannabis researchers. 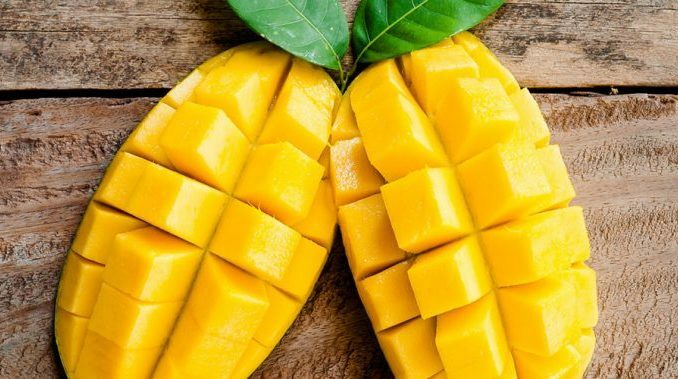 Research has also shown myrcene has a powerful antioxidant effect, protecting human and animal cells from destruction by all sorts of free-radicals produced in the body through physiological processes, disease, toxin exposure and other mechanisms. Free radicals, or oxidants, are unstable chemicals that kill cells by combining their loose oxygen atoms with DNA or other cell components as they seek a more stable form. Scientists use a standard chemical called t-BOOH in experiments to test protective effects of different molecules. This t-BOOH chemical is a reliable and easily synthesized stand-in for all sorts of oxidants produced by disease and toxin exposure. Myrcene is a central component in essential oils of thyme. A study of high-dose thyme oil showed it protected the livers of rats against the deadly carcinogen aflatoxin through its antioxidant properties. Aflatoxin is a common, well-known carcinogen produced by fungus that infects crops like peanuts and grains. In the U.S., aflatoxin exposure is a minor issue, but it’s more common in the developing world. Myrcene and other terpenes found in various plants, including cannabis, are also effective in killing various parasites that infect humans. Leishmaniasis, for instance, is a tropical disease caused by protozoa transmitted to humans through the bite of certain species of sand flies. Symptoms include skin sores, fever, low blood counts, swollen glands and enlarged spleen, among others. A 2017 study published in Experimental Parasitology looked at the effects of a medicinal plant preparation on the Leishmania parasite. 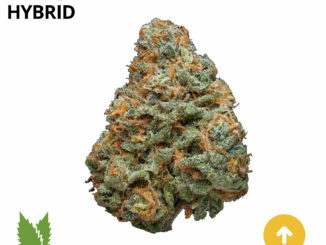 Different kinds of myrcene made up more than 30 percent of the preparation (most of the rest of the solution’s makeup were also terpenes found in cannabis). The plant preparation seemed to stimulate the immune response to the Leishmaniasis, providing significant benefit.